If you have a Blog, website or a Facebook page , then you can earn Free coins and game coupons from us. 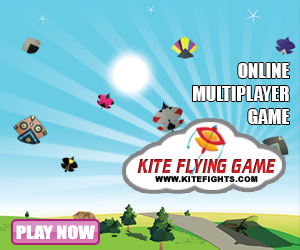 All you need to do is to Promote our game www.kitefights.com on you blog, website or Facebook page. and send us link of your website , blog or facebook page where you have promoted our game. We will check it and will award you Free coins starting from 10,000 Coins till 100,000 Coins or more depending on how good is your website. If you have a high traffic website, blog or Facebook page we can give you Coins + Coupons on Monthly Basis to use or distribute .